Militant soccer fans of arch rival Cairo soccer clubs Al Zamalek SC and Al Ahly SC represent two sides of the same coin in the forefront of a struggle for the future of Egypt. Militants of the Ultras White Knights (UWK), the Zamalek support group, are locked near the US embassy in Cairo into vicious street battles with police and security forces, one of a string of confrontations since last year’s toppling of president Hosni Mubarak. In the ultimate analysis, their struggle aims to force reform of Egyptian law enforcement, the country’s most despised institution, which is widely seen as the brutal enforcers of Mr. Mubarak’s repressive regime, even if those on the battlefield often express their goal in simpler terms of revenge and settling scores. On the other hand, Al Ahly militants, who together with UWK played a key role in ousting Mr. Mubarak as well as in subsequent street battles that have left scores dead and thousands wounded, have turned their ire on the management of their club in an effort to combat corruption in Egyptian soccer. Neither battle is easy but achieving victory in the struggle in which UWK has taken the lead is likely to prove far more difficult than turning soccer into a model for the fight against corruption in Egypt and removing the remnants of the Mubarak era. In a conciliatory move as violence raged around the US embassy in Cairo that no longer had anything to do with the bigoted, fringe US video clip that sparked mass protests across the Muslim world and everything with deep-seated ultras’ animosity towards law enforcement, Ultras Ahlawy, the Al Ahly militants, said they were satisfied with progress in a trial of 74 people, including nine security officials, accused of responsibility for the death in February of 74 of their colleagues in a politically loaded soccer brawl in Port Said. The ultras’ gesture in a statement late Thursday came days after they had stormed their club’s training ground as well as the offices of the Egyptian Football Association (EFA) to protest the slow progress of the trial and the willingness of the club’s management to acquiesce in the lifting of a seven-month old suspension of soccer imposed in the wake of the Port Said incident before justice for the dead had been achieved and that involved banning the fans from attending matches. 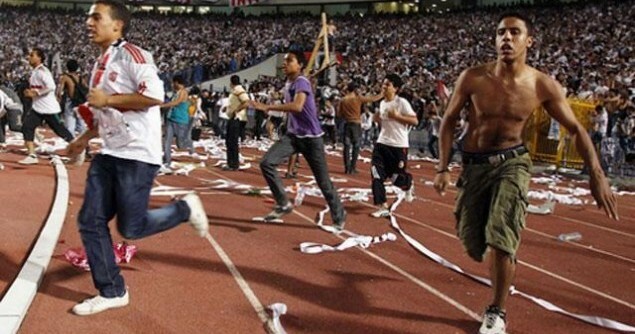 The statement was in stark contrast to repeated assertions by the ultras that the “real culprits” of Port Sid, the leadership of the military and the police and security forces, were not being held accountable for the worst incident in Egyptian sport history. The brawl, in which police did little to prevent the 74 deaths, is widely believed to have been a failed attempt by the military and the police to teach the ultras, emboldened by the overthrow of Mr. Mubarak, a lesson. It is also widely seen as an effort to cut the ultras, one of Egypt’s largest, most organized civic groups, down to size. “Seven months have passed since the death of our dearest friends. Regardless of the postponement of trial proceedings to Sunday, [the court] has gone a long way towards realizing justice, which will mollify martyrs’ grieving families,” Ultras Ahlawy said on their Facebook page, which has some 577,000 followers. They attacked Al Ahly’s management for not doing enough to “safeguard the rights of the martyrs,” singling out club chairman Hassan Hamdy. Mr. Hamdy, who doubled as head of advertising of Al Ahram, the flagship of Egypt’s state-run media, has long been seen as a corrupt Mubarak crony. The ultras hold him responsible for a decision by the Switzerland-based Court of Arbitration of Sport (CAS) to overturn a ban imposed by the EFA on Al Masry SC for the role its fans played in the deaths of the Al Ahly militants. CAS issued its ruling after the EFA failed to attend a court hearing. Fan fury was further fanned by Mr. Hamdy’s endorsement of world soccer body FIFA executive committee member Hani Abou-Reida, a former member of Mr. Mubarak’s National Democratic Party, for the EFA presidency. “We demand the resignation of Hassan Hamdy’s corrupt board, which neglected the rights of the martyrs. Hamdy endorsed Abou-Reida merely to serve his own interests,” the ultras said. Ousting Mr. Hamdy and defeating Mr. Abou-Reida in the upcoming EFA election is likely to prove a walk through the woods in comparison to reforming the police and security forces with whom the ultras have been locked into battle in stadiums and on streets since their emergence in 2007 as the most militant force confronting the Mubarak regime. Reforming the authoritarian police and security forces goes far beyond simply removing Mubarak era figures from their posts. It involves a top-to-bottom radical institutional change and introducing a new organizational culture. It means grooming a community-oriented corps that is depoliticized, focused on protecting civilians and combating domestic violence rather than repressing opposition groups and trained in the respect of human rights and conducting real investigations instead of extracting forced confessions. It also means downsizing the corps which out numbers the military by a ratio of almost 2:1 as well as the bloated interior ministry that oversees it and rewriting laws that have turned the police and security forces into political executers. All of that is easier said and done. But without it, taking the sting out of repeated, violent confrontations between the highly politicized, street battled-hardened ultras and the police and security forces in a bid to keep Egypt on a steady course of political transformation and economic recovery is likely to prove difficult at best, if not impossible. The Turbulent World of Middle East Soccer is the progeny of James M. Dorsey, a senior fellow at Nanyang Technological University’s S. Rajaratnam School of International Studies. Soccer in the Middle East and North Africa is played as much on as off the pitch. Stadiums are a symbol of the battle for political freedom; economic opportunity; ethnic, religious and national identity; and gender rights. Alongside the mosque, the stadium was until the Arab revolt erupted in late 2010 the only alternative public space for venting pent-up anger and frustration. Soccer has its own unique thrill – a high-stakes game of cat and mouse between militants and security forces and a struggle for a trophy grander than the FIFA World Cup: the future of a region.